Germany took top honors at the 2014 World Cup hoisting the trophy for the first time since 1990. Die Mannschaft lead the way with 18 of the tournament’s 171 goals. For the 2nd consecutive World Cup, Thomas Muller knocked in 5 goals but unlike 4 years ago this was not good enough to claim the Golden Boot. 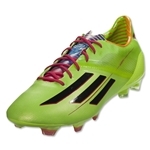 Colombia’s James Rodriguez in his adidas F50 adiZero Battle Pack cleats claimed the Golden Boot with 6 goals. The feat was made even more impressive considering 2 or 3 of the goals were arguably in the mix for goal of the tournament. adidas led the way among the brands with 79 goals scored in one of their silos while Nike was right behind with 78 goals. Check out the other brands that found the back of the net in Brazil.